Dog Days: the period between July and September when heat and stagnation hit. It’s also just about when you’ ll page through this magazine for the first time. But we know that many nonprofits will suffer from not only the heat of the season but also the heat of the “kitchen,” so to speak, as they look at their midyear budgets and their plans amid a weak economy. This issue’s cover depicts a position we all might find enviable: in a choice paradise like the featured Labrador surrounded by tennis balls. In this issue, we’ve addressed a host of concerns to help get you—if not to the heavenly tennis balls—at least to a place where your organization can grasp its situation and continue its vital work more effectively. 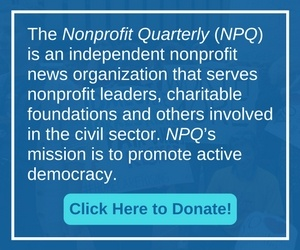 Welcome to the Fall 2007 issue of the Nonprofit Quarterly. It is full of interesting organizational stories and case studies brimming with drama, suspense, twists and turns—you know, the daily stuff of nonprofit life. We’ve all heard them, the stories of nonprofit organizations that folded unexpectedly, merged with an unlikely partner, faced board turmoil, or achieved unprecedented success. One of the nation’s leading federated organizations is in the midst of a massive transformation effort that they hope will enable it to serve girls more effectively while making it competitive in its market. An AIDS organization’s transition from an informal familial atmosphere is a brutal affair. Every organization has a story we can learn from. What are the change drivers in the organizational sagas that follow? A new nonprofit takes an “innovative” path, but this course has been charted before. Welcome to the Winter 2007 issue of the Nonprofit Quarterly, “Transcending the Organization.” In this edition you will find articles proposing that sustainable nonprofit organizations as we now understand them are not the goal of our work, nor are they always even the most effective vehicles for achieving our missions. Sometimes, in fact, organizations—and our assumptions about their centrality and structural requirements—distract us from the work we must do to keep our democracy and our communities healthy and vibrant. This may be particularly true in the last ten to fifteen years when so much of the conversation we have with our funders focuses on organizational rather than transformational capacities. Of course these two characteristics should be linked—but sometimes they do not seem to be. Sometimes, not following a strategic plan frees us to recognize what’s in front of us. What is excessive compensation of a nonprofit leader? The IRS is paying closer attention, so should you. Centro Presente, a leading organization in the immigrant justice movement, energized its mission and constituency when it moved from a top-down board to a governance structure that engaged a broad array of stakeholders.